Goldilocks & Her Doodle: Excursion! Milton and I like to take little field trips together on long hot summer days. One of our favorite stops is Michael's, which, of course, is followed by a quick trip to PetSmart, located directly next door. The two of us usually amuse ourselves in the doggie section of the store, sniffing the bones and looking for pups to greet, but on this occasion, I deviated from our usual path, and we decided to peruse the bird selection. For a dog like Milton, who desperately wants to nab a bird but, sadly, has never been successful, he was utterly and completely entranced. It was a private hunting ground just for him as he silently and stealthily observed the birds dart about in their sanctuary. After quite some time of deep stares and jumps to get a closer look, I thought it best to relocate to another section of the store. I could only imagine Milton's 62-pounds breaking the glass and birds flooding everywhere. I wasn't in the mood to pay out, just so he could finally have a victory. I don't think the birds nor the PetSmart employees were too happy with Milt Dog stalking their lair, but it certainly brought a smile to my face and a little excitement into Milton's day. 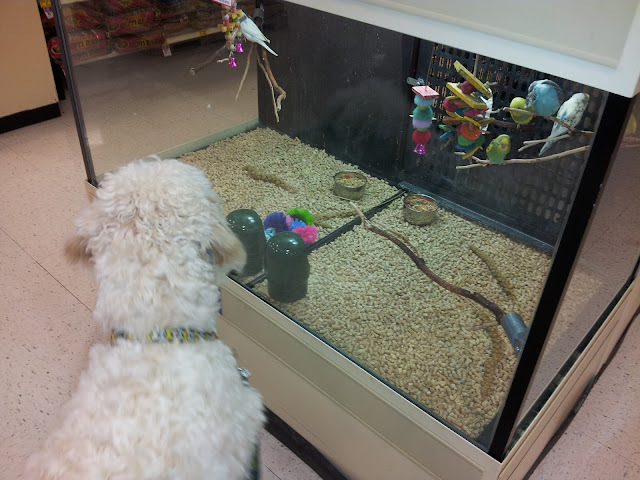 Next time you stop by a pet shop, veer over to the bird section and see how your dog responds; it might surprise you or at least cause you to giggle just a little bit. Milton looks much bigger than 65 pounds. Stanlee is now just shy of 90. UGH!!! 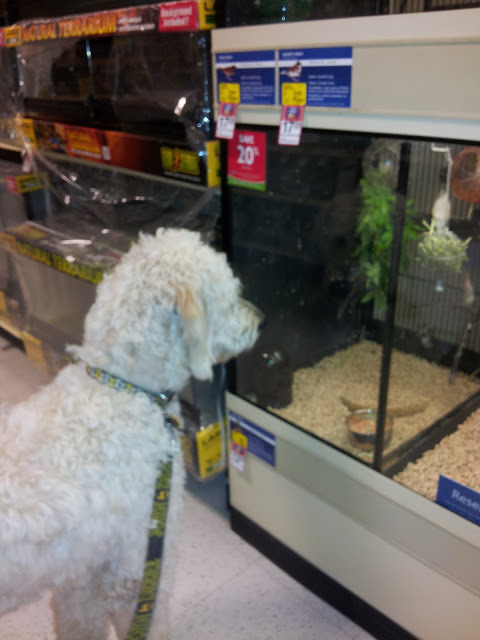 This makes me want to take my boy to PetSmart this weekend just to take pictures. How funny is that! The only thing Stanlee has caught so far is an attitude. 90 pounds is tremendous! I really wish Milton would grow more. He is just not a big foodie...! This is a horrible picture of Stanlee BUT it shows him next to our french doors; you can see how tall he is compared to the doorknob. He is incredibly big AND cute! It seems that everyone who always mentions to me that they know a cousin/aunt/sister with a doodle that the dog completely surpasses Milton in girth! Maybe we should be feeding him more.